Despite the unfortunate start with the broken down taxi, things took a turn for better once we reached the airport. 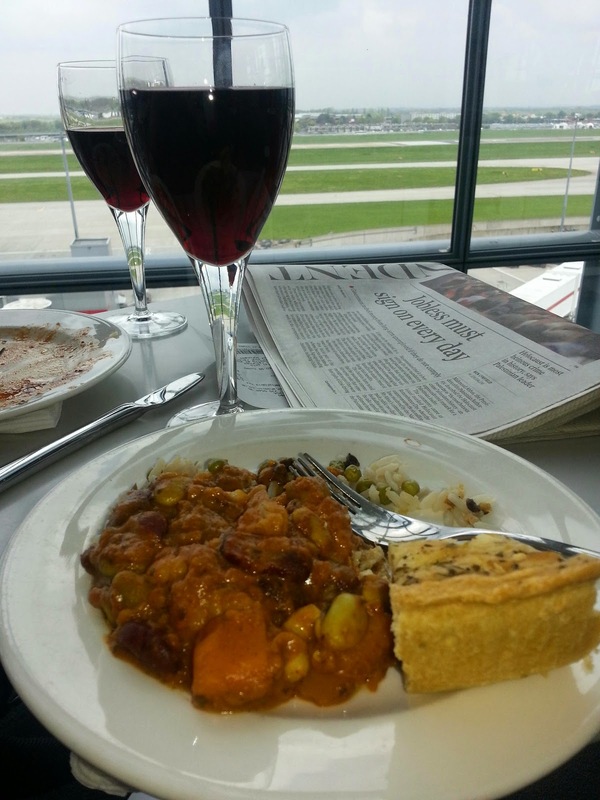 We were able to use the Malaysian Airline's lounge because of Rich's points accumulation last year so didn't have to pay over the odds for food in the airport; making the most of the free wine, food and wifi. At the departure gate a fearsome woman stood guarding the gate rottweiler-esque. Despite announcing that silver card members could "board at their leisure", this wasn't actually the case. Instead she insisted on letting families with young (under 5) children on first, but some of these children were easily in their teens and I'm sure, for a few of them, puberty was now a distant memory. Eventually, when we could board, rottweiler lady snatched our tickets to scan them then marched off with no explanation. She stood fumbling with the computer and muttering to herself only to come back a few minutes later to a much longer queue to tell us that we were at the wrong boarding gate and that we needed to go "over there", waving her hand like she was telling annoying children to scarper. "But that's the business class gate", we said. "Yes" she replied, without even looking at us, already dealing with the punters behind us. So it would appear that we'd been upgraded. Very nice too, we weren't going to argue. I spent the first hour of the flight playing with the various seating positions, all controlled electronically and I felt very Captain Kirk. The next twelve hours passed very quickly, lurching from one drink to the next along with an accompanying meal of one type or another. It seemed a shame to have to actually go to sleep on my fully reclined bed/seat for fear of missing out on something. Alas I succumbed. We're now at Kuala Lumper waiting for the next flight to Auckland. Though we're in the lounge neither of us fancy any more wine or food. I know how "fat cats" get so porky though if this is the life they lead. I wonder if that taxi is still on the drive. The taxi arrived early and we're all ready to go. In the car we get and the driver turns the key in the ignition. Nothing. His car has packed up. Not a brilliant start to the holiday. On the bright side a replacement taxi turns up moments later after a desperate phone call and we are on our way. "Which way do you wanna go cos the motorway is chocca and the city's fucked" the driver chirps. "Motorway please" we say. Then we're given the sob story that he was supposed to be finishing his shift and he didn't want this job anyway. I love a cheery driver. The holiday, and I know that word doesn't do it justice, has started off just the way I like it. An empty M25 made for a very efficient trip to the airport, Terminal 5 was a breeze to get through and we have access to the BA lounge courtesy of all the points Rich racked up on his business trips to Chicago last year. So, we're making the most of the free stuff.